Why was the inverted yield curve important? What Performs Best During Inverted Yield Curve? There has been a lot of discussion about the inverted yield curve lately. The purpose of this article will be to dispel any rumors that exist about what this symbolizes for the economy. There are a three categories of metrics investors with a keen focus on macro economics need to focus on: company specific metrics researched through reading regulatory filings and researching the competition; the mainstream economic reports such as the ISM reports and the jobless claims; and forecasting metrics which can help you understand where the economy is headed. These forecasting metrics don’t just help you time recessions. They help you figure out where the economy is in the business cycle. Certain sectors do better in each part of the business cycle. The parts are the following: recovery, mid cycle, late cycle, and recession. As of late-2017 the U.S. economy is probably in the late cycle, but some of the emerging markets economies are acting as though we are in the early part of the cycle, a response that is happening due to the high levels of monetary stimulus. We’ll discuss which sectors do well in the late cycle economy in this article. One of the forecasting tools used to pick out where the economy is in the business cycle is the yield curve. The yield curve is a line plot of the treasury yields matched with their maturity dates. In a normal curve, the yields increase with longer dated bonds. With an inverted curve, the yields are lower as the maturity dates are further in the future. A normal yield curve is associated with expansions; an inverted yield curve is associated with warnings about recessions. The Fed plays a role in affecting the short end of the curve with the Fed funds rate. Central bank fed funds rate hikes which go too far can push short-term rates higher than long-term rates, which is an inversion of the yield curve. Usually the Fed hikes rates because inflation is increasing and needs to be tamed. In the last couple of cycles, oil price rallies caused inflation to increase, pushing the Fed to raise rates. While inverting the curve and causing a recession isn’t ideal, sometimes it’s necessary to save the economy from excess inflation. After an inversion of the yield curve occurs, the Federal Reserve cuts rates, generally as this is correlated with an economy that is faltering, which is a result of the initial hiking of rates. As you can see, the Fed creates its own feedback loop that requires it to do and undo its actions. However, at this stage of the cycle something different has been happening – the Fed has been raising rates despite low inflation as measured by the core PCE and CPI. As of December 4th, the difference between the 10 year yield and the 2 year yield was 59.9 basis points. As you can see from the grey line below, that implies the economy is at the end of the cycle as it was above 250 basis points in the beginning and middle of the cycle partially because the Fed had rates at 0%. 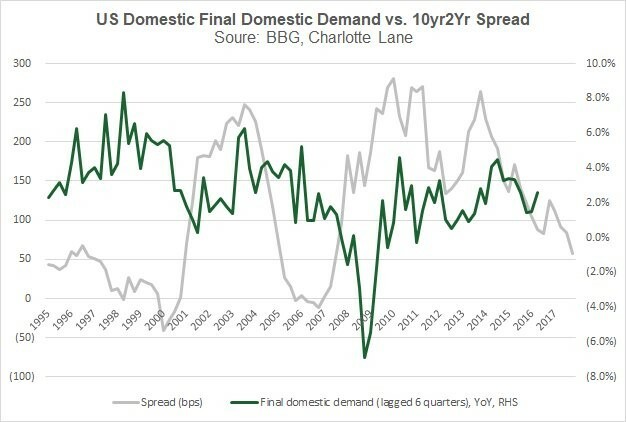 The chart demonstrats that as an inverted yield curve occurs, the final domestic demand growth falls. A flattening yield curve doesn’t imply domestic demand growth will falter in 2018 because the signal for a recession occurs only when the curve inverts. Even then, there could be a delay between the the inverted yield curve and an actual recession, as this occurred in the late 1920s. Are We About To See An Inverted Yield Curve? 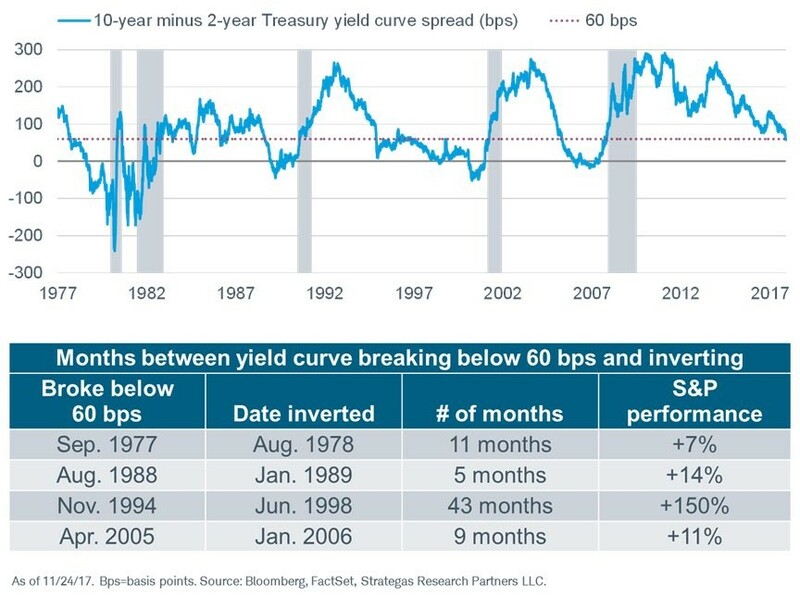 Mathematically, we are nearing an inverted yield curve since it has flattened about 200 basis points and needs to flatten 60 more basis points to be inverted. However, the timing isn’t that simple. The curve doesn’t uniformly flatten like how an hourglass measures time. It might take a few months for an inversion to occur or a few years. The table below details the time it takes for the yield curve to fall from 100 basis points to an inversion. Keep in mind, this chart uses the 6 month treasury bill as the short end and the 10 year bond as the long end. As of December 4th, the difference between the 6 month and the 10 year yield was 97.5 basis points. As you can see, the inversion time has varied from 1 month to 33 months, with the median being 7 months. The inversion doesn’t signify a recession is coming right away; there’s usually a sizable gap between the inversion and the recession which is why the chances of a 2018 recession are slim according to this indicator. The median time from an inversion to a recession is 14 months, varying from 8 to 23 months. 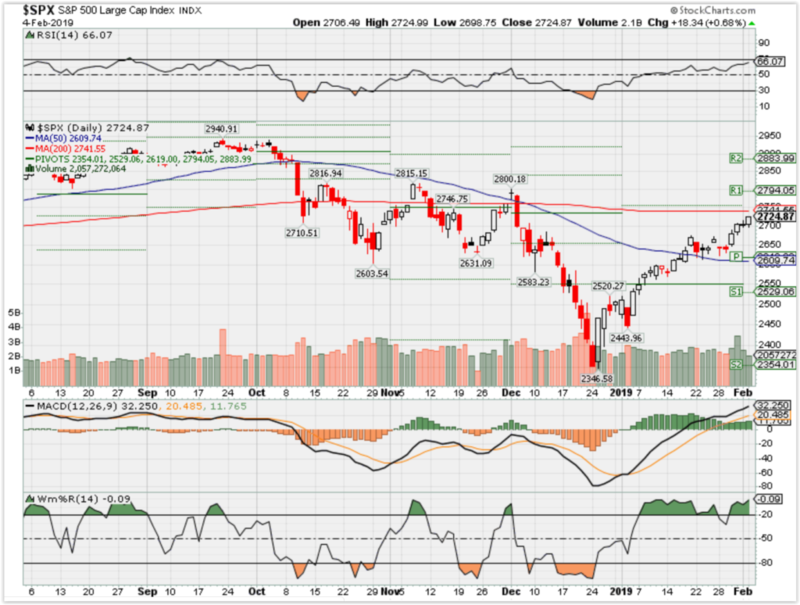 Stocks generally move up unless there’s economic strife. Therefore, it’s not surprising to hear that stocks go up when the yield curve flattens at the end of the cycle. Sometimes stocks move up a lot because at the end of bubbles there is often a blow off top where incredible returns occur. The chart below looks at the 10 year- 2 year spread. 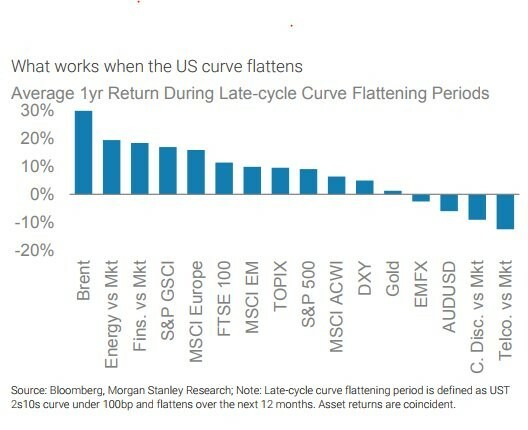 In the last 4 cycles, the curve inverted 17 months after getting to 60 basis points on average. The average annualized gain is 24.44% during the flattening period. That gain is boosted by the 1990s performance which shows how blow off tops can occur. It can be advantageous to buy stocks before a recession if you know when to get out. The chart below helps answer that question. As you can see, oil does well and so does the financial and energy sectors. Energy and oil do well because inflation usually increases at the end of the cycle, meaning oil prices are going up along with the other commodities. Financials do well because the Fed fights inflation with higher rates. Higher rates mean higher net interest margins. The telecom sector under performs because rising bond yields mean investors don’t need to buy high yielding telecom stocks, which act as bond-like instruments, to get the returns they crave. Consumer discretionary under performs because input costs go up, squeezing margins. Inflation also hurts the consumer’s purchasing power. The table below has different returns for the flattening period than the chart in the middle of this article because it uses the 6 month bill as the short end. This chart also has energy doing well and consumer discretionary impacted poorly. Utilities do poorly for the same reason as telecom stocks. They have high dividend yields which face greater competition from fixed income investments when bond yields go up. Tech was involved in the blow off top in the 1990s, but other than that it has had middling performance in the flattening periods. In this cycle, Google and Facebook dominate the sector. 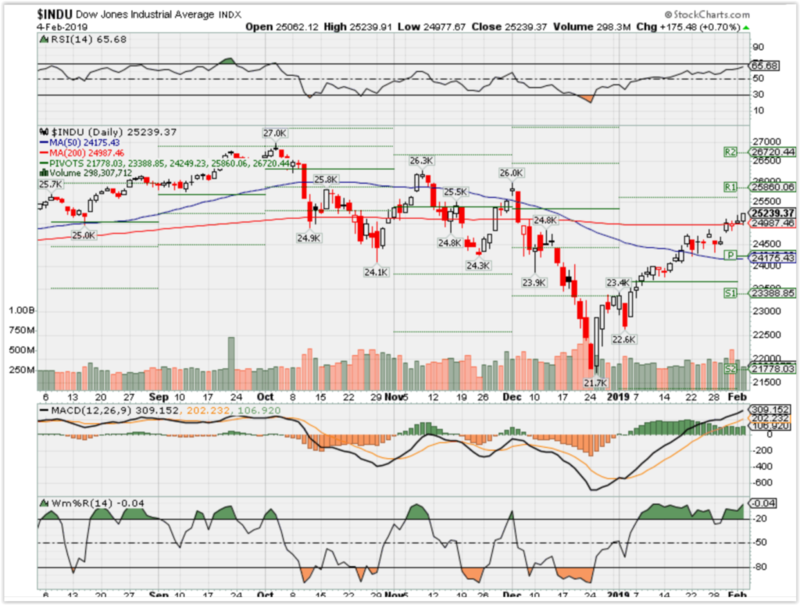 They may act in tune with consumer discretionary stocks because they are advertisers. This is just one factor among the many you should look at when determining the point in the business cycle and which weightings to have in your portfolio. For example, you would want to research how the GOP tax plan will affect each sector before deciding. That being said, this article is a great starting point to see the effects a flattening yield curve have on certain assets. Be sure to check the yield curve weekly to see if the situation changes. Good economic reports or a dovish Fed not intent on raising rates further could cause it the yield curve to steepen. CNBC’s Jim Cramer says low expectations helped Facebook, General Electric and Apple’s stocks come out on top after earnings. Facebook’s results suggest the social media giant has finally managed to move past its scandals, the “Mad Money” host says. As for GE, its quarterly report gave investors a sense that “the worst is over,” Cramer says. Facebook, General Electric and Apple have all proved how powerful low expectations can be, CNBC’s Jim Cramer said Thursday after Facebook and GE surprised Wall Street with their quarterly earnings reports. 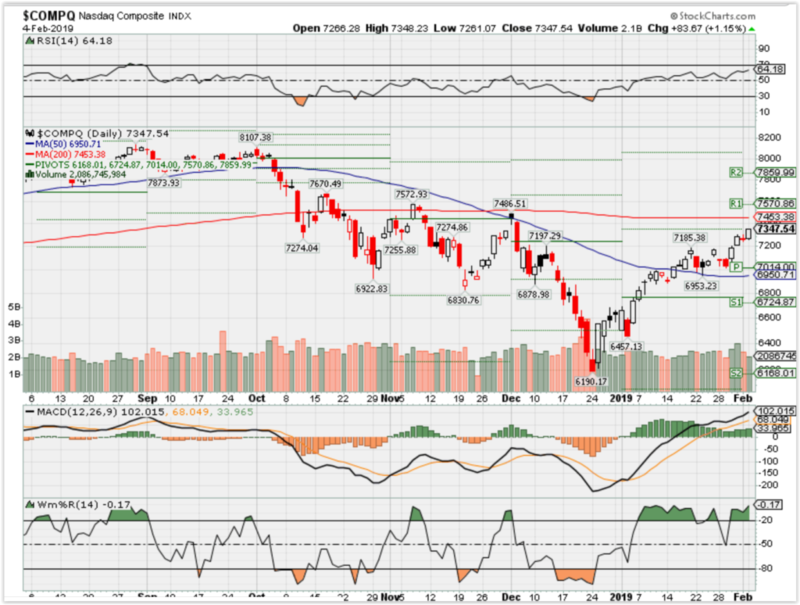 “But, man, if President [Donald] Trump can work out a trade deal with the Chinese, I bet Apple could become … close to, maybe, a $200 stock again, ” the “Mad Money” host added. Led by an appallingly incompetent German management, the European Union will most probably come out terminally fractured after next May’s parliamentary elections. The political forces already at work in a number of countries will go back to nation states and a free-trading area, abandoning the pipe dream of a European statehood and sovereignty. That may not scuttle the euro because such a free-trading area needs a common currency to be a genuine customs union and a homogeneous single market. In spite of that, the Germans and the Dutch liked the prospect of sharing the European Union membership with British free-traders, apparently as a counterweight to overbearing Frenchstate interventionists. Presidential candidate and later President Donald Trumpunderstood all that. He told Merkel that trade free-riding on the U.S. was over, and so was Washington’s total underwriting of German security. Apparently shocked by the lack of American solidarity (stupidity), Merkel’s response was that“Europeans truly have to take our fate into our own hands.” In other words, never mind, Germany will continue to bilk Europe. As the adage goes, there are only two certainties in life: death and taxes. And if Vermont Senator Bernie Sanders’ new tax plan were to go into effect, death would trigger much higher taxes for the billionaire set. Under Sanders’ new tax plan announced Thursday, billionaires would be subject to a 77 percent estate tax, which is the tax levied on the cash, property, real estate and other assets ( “everything you own or have certain interests in, ” according to the Internal Revenue Service) of a deceased person when it is transferred to another person. In 2018, the Tax Cuts and Jobs Act put the estate tax at 40 percent after the first $11.18 million, according to the Internal Revenue Service. “Our bill only applies to the richest 0.2% of Americans,” Sanders tweeted earlier on Thursday. Amazon co-founder Jeff Bezos, 55, is currently set to pay $53 billion in estate taxes, and would have to pay $101 billion under Sanders’ plan. Microsoft co-founder Bill Gates, 63, is currently set to pay $38 billion in estate taxes, and would have to pay $74 billion under Sanders’ plan. Berkshire Hathaway CEO Warren Buffett, 88, is currently set to pay $33 billion in estate taxes, and would have to pay $64 billion under Sanders’ plan. Oracle co-founder Larry Ellison, 74, is currently set to pay $24 billion in estate taxes, and would have to pay $46 billion under Sanders’ plan. Facebook founder Mark Zuckerberg, 34, is currently set to pay $22 billion in estate taxes, and would have to pay $41 billion under Sanders’ new plan. The proposed estate tax rates under Sanders’ new plan are tiered and impact the top 0.2 percent of Americans: from $3.5 million up to $10 million in assets owned upon time of death, the tax rate would be 45 percent; from $10 million to $50 million, the tax rate would be 50 percent; and from greater than $50 million to $1 billion, the tax rate would be 55 percent tax. Changing the estate tax is not unheard of: Indeed, the estate tax has fluctuated from year to year for most of the last 20 years “creating uncertainty for taxpayers and their advisors,” the Joint Committee on Taxation says in a primer on the U.S. Federal Wealth Transfer Tax System published in 2015. However, Buffett addressed Republicans’ idea to eliminate the estate tax in an interview with Becky Quick on CNBC’s Squawk Box in October 2017. “I don’t think I need a tax cut,” Buffett said. ”[I]f they passed the bill that they’re talking about, I could leave $75 billion to a bunch of children and grandchildren and great grandchildren, and if I left it to 35 of them, they would each have a couple of billion dollars. They could put it out at 5 percent and have $100 million. Still, some are fierce critics of the estate tax, even at current levels. “You work your whole life to build up a nest egg or a family-owned business or family farm. Then you pass away… Uncle Sam can swoop in and take over 40% of everything you’ve earned over a certain amount. It’s just wrong,” House Ways and Means Committee Chairman Kevin Brady said in August 2017, when the estate tax was being considered then, according to CNN. CNBC’s Jim Cramer checks in with Democratic Sen. Elizabeth Warren, who calls on billionaires like Howard Schultz and Michael Bloomberg to pay “their fair share” in taxes. “I want these billionaires to stop being freeloaders,” Warren says. The Massachusetts senator is considering a run for president in 2020. “We have watched billionaires stand up and say, ‘Look, I want to run for president. And one of the first planks in my plan is going to be no new taxes for billionaires,’” she told Cramer. Even accounting for slower earnings growth, Baidu’s earnings multiple of 13 looks dirt cheap. Gross margins, although dropping, remain over 50%. Rising costs and R&D still come in under 70% of gross profit. 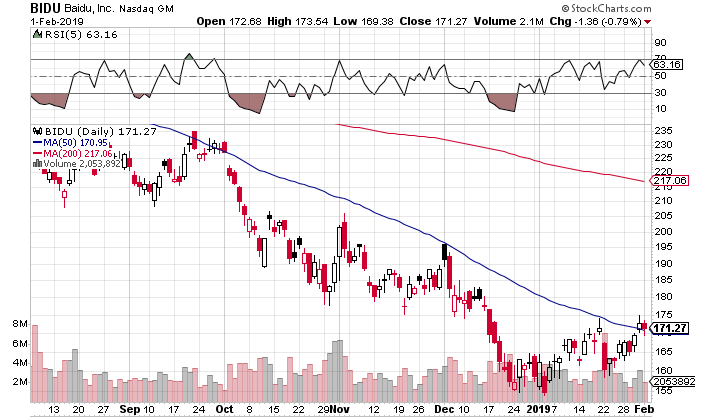 Although Baidu, Inc. (BIDU) has rallied back over $170, we still remain underwater on our position by just over $20 a share. We wrote recently how regulation in the company’s search segment has slowed growth. Baidu’s customers are not spending as much as they once did due to this regulation and also a slowing Chinese economy. When growth stocks hit a speed bump, Wall Street takes notice. Nobody knows whether Baidu’s peer-leading growth will return, irrespective of its fundamentals. We all know how management has been talking up its prospect in the AI space. For example, the fundamentals of the firm’s software (Apollo) in the autonomous driving space look to be really strong. Will progress here though significantly impact the company’s income statement over the next year or so? Probably not. Instead of solely focusing on slowing growth rates, we believe investors should be focusing in on other areas of the income statement. As mentioned in previous commentary, Baidu’s present earnings multiple of just under 13, for example, is light years behind the industry average of 35. A long investment here is getting plenty of earnings irrespective of growth rates. Apart from that, though, let’s look at Baidu’s income statement and explain what continues to attract us. All numbers below are in Chinese yuan. Over the past 10 quarters, Baidu’s cost of revenues has easily outpaced the growth of its top line. Gross margins, as a result, have dropped to around 50%, which is quite a distance from the 70%+ margins the firm enjoyed back in 2010 and 2011. However, I do not feel Baidu’s 50% gross margin number is a cause for concern here just yet. For example, Tencent Holdings Limited (OTCPK:TCEHY) and Alibaba Group Holding Limited (BABA) both are operating with gross margins under 50%, and Alphabet’s (GOOG) is at the 57% mark. Gross margin is a critical metric on the income statement because it demonstrates whether the company in question has a clear competitive advantage or not. Roughly half of what Baidu still sells is gross profit. No cause for concern here. When we move onto operations, we have the “Research & Development” tab and “Selling, general and administrative expense”. As we all know, there are many companies that have excellent gross profits, but their operating costs can drive the company into the ground over time. Again, we are focusing in on the important trends here. In the firm’s latest quarter, Research & Development came in at 3.9 billion and Selling, general and administrative expense came in at 5.64 billion. Despite recent content and traffic costs, operating costs have increased by 43% over the past 10 quarters, whereas gross profit has increased by 46%. This is a good starting point. Furthermore, operating expense at present makes up about 68% of the firm’s gross profit. This is important, as it shows Baidu has sustained competitive advantages which are still evident in times of elevated spend. Even if operating income growth continues to slow, Baidu may need to continue to pivot in what has become a fiercely competitive tech sector. The company already holds 41.2 billion of debt on its balance sheet. To see how this debt is affecting the income statement, we look at the interest expense line item. Over the past four quarters, Baidu has paid out 1.7 billion in interest payments on its debt. Operating income over the same time frame came in at just over 19 billion. Again, we do not see any adverse trend here in terms of how profits could be affected by debt. Baidu is not financially distressed. This brings stability to the company concerning future growth. To sum up, analysts who follow this company are projecting 20%+ bottom line growth rates per year on average over the next 5 years. We expect this should move the needle with respect to the share price. If that projected growth does not happen, however, Baidu’s income statement doesn’t look like it will come under pressure anytime soon. Gross margins of 50% continue to drive earnings forward. We maintain this stock remains a Strong Buy at this moment in time.